Once upon a time, a Narrator, either named or unnamed, told stories from on high. This narrator, like a deity, could see all, and was therefore in a position to tell all. At some point, literary boffins decided to call this style of storytelling omniscient narration, and it began to fall out of favour. Nowadays, authors of literary fiction, women’s commercial fiction and thrillers in particular favour a more intimate style of narration. They tell stories in the first person, or from the viewpoint of two or three characters, (which literary boffins call third-person limited) to help readers feel they’re right inside the minds of these characters. I think it’s a pity that omniscient narration is somehow seen as inferior. Yes, it can be more impersonal, but when it’s done right, it leads to big, sumptuous stories that can dazzle you with their scope. 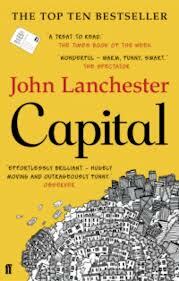 Capital by John Lanchester is a fine example of omniscient narration. It’s a multi-layered narrative that tells the story of modern London through the eyes of the inhabitants of a single street. Here are three reasons why omniscient narration works so well. As I said earlier, omniscient narrators are like gods. This means that they can see around corners. When you write in a more intimate style, you’re limited as to what you can reveal about your characters, because your narrator mightn’t be familiar with important details about the other characters’ lives. But with omniscient narration, you have the flexibility to reveal whatever they need to reveal about their characters to make the story flow. When you choose omniscient narration, you can create a panoramic view of an entire world. You’ve got a wide canvas to work with, and you can fill it with rich background detail about the world the character lives in. This kind of storytelling allows readers to completely immerse themselves in a new world, and it’s still possible to create intimacy by giving character portraits of the people who live in that world, as John Lanchester does in Capital. If you’re naturally a more plot-driven writer than a character driven one, omniscient narration gives you the chance to put your story centre stage. The story becomes th cornerstone of the book and you can use your large cast of characters to help you carry that story forward. Do you favour omniscient narration, as a reader or a writer? Or do you prefer more intimate forms of narration? Thanks to all the people who read this blog and commented on the posts during 2014. Your interest is much appreciated. WordPress created this lovely feelgood report showing who read my blog and how many hits it got, so I thought I’d share the good news with you. Words are a writer’s stock in trade. Good writers can bend words to their will. For them, words are a second skin. One of the ways they learn to master words is by playing with them. Playing with words is not only fun, it breaks down inhibition and shows you that words are your instruments, which can be used to express whatever you most long to express. In the first creative writing class, I devote a fair amount of time to activities that encourage participants to play with words. Here are three of them. I can’t think of a better way to achieve immortality than to invent your own word, and this activity helps participants achieve this potential immortality. Participants come up with a word and a potential definition for that word, and then they write their word and definition on a big sheet of paper for all to see. This goes down particularly well with children, who instinctively understand that language is malleable and all you have to do to create a completely new word is swap round a few letters. Playing with words can be a building block to creating stories, as there can be surprising links between words. I do a number of exercises that encourage participants to come up with words and weave them into stories. In Story Soup, they write the name of an animal, a colour and a place on a sheet of paper. They drop the sheet of paper into a hat and then the hat is passed around. They take a piece of paper out of the hat which isn’t their own and write a story that includes those three words. Playing with words encourages writers to come up with more inventive images and steer away from clichés. Some of the activities I use ban participants from using certain words, which encourages them to come up with fresher alternatives. In The Kitchen Sink, I give participants a theme, often a seasonal one like Christmas or Halloween. I ask them to come up with one word each that’s associated with that theme. They put the words on a big sheet of paper, and then they write a piece about that theme without using any of the words on the sheet. What ways have you found to be inventive with words? Feel free to spread the word. This is a time of year when we’re filled with hope that we’ll achieve great things. Writing a book is up there on that list of great ambitions, and for many people, making a start. It’s pretty daunting when you’re standing at the bottom of the mountain, looking up at the peaks you’ll need to scale. A couple of years ago, I created a service to help these budding authors reach the top of that mountain. It’s called The Writing Space and it’s based on the idea that taking the time out to figure out what you want to write is the first vital step on that journey up the mountain. It offers a map that will guide them up the mountain, with easy steps to follow, so they can break the journey down into bitesize chunks. Put in practical terms, The Writing Space is a coaching service that helps people crystallise the idea that’s been germinating at the back of their minds, and gives them a structure that will help them put a shape to their ideas and finish their book. The Writing Space is aimed at people who want to write a novel, a collection of short stories or a memoir. There are two types of people that it particularly suits. People who have always wanted to write a book, but find it hard to narrow themselves down to one idea. People who have a very specific idea for a book and need help expanding that idea to fit it into book form. These people may never have written in their lives, or may already have started the book, but find themselves stuck at an impasse and need help continuing. I organise one-hour coaching sessions with these potential authors, where we discuss their ideas and how to bring them to fruition. We start with why they want to write. It is that why, that passion, that will help push them forward during the tough climb that lies ahead. We also discuss their potential audience, who the book is aimed at, and what category of writing it would fit into. If people don’t have a specific idea yet, we discuss topics that could be mined for book ideas – their passions, areas of expertise and important life events. Based on what we discuss, I will then give recommendations on how they can move forward. I will give advice on structure and how to divide ideas into chapters. I will give feedback on the form their book will take, whether it should be a novel or a memoir. I will also point them towards resources which will be helpful to them in writing their book, such as websites, how-to guides and courses. I will summarise the points discussed in our session in a report, which will also include the recommendations I have given. For non-fiction works, I will suggest a potential chapter structure, which will outline the topics that will be covered in each chapter. For fictional works, I will give suggestions regardingcharacterisation, plot, setting and point of view. If the person hasn’t written before, I will suggest topics for them to write about and exercises that will help them get started. In many people’s minds, coaching and consultancy can seem beyond the reach of their budget. If people want to avail of expert advice but are constrained by budget, they can avail of the coaching session only, as it will still give them the tools they need to scale the mountain. Also, The Writing Space gives people the chance to get one to one attention from a professional writer, and I aim to ensure that they’ll feel the investment was worth it. Would you find a service like this useful? Have you ever availed of such a service?